Lupins are perennial easily grown from seeds or as seedlings and are readily available for sale online. Although there are many species the most popular lupins for the garden (Ornamental Lupins) are Hybrids, with Russell Hybrids being the most popular. Depending on cultivar Lupins will grow from 1' to 4' with Russell hybrids being a tall cultivar. Lupin flowers come in a range of colours including pure white, red, pink and deep purple. A clump forming and the tall flower spikes are a showy addition to the garden border. Smaller growing hybrids are suitable for growing in pots. Lupin seeds collected in the home garden may not come true to colour. 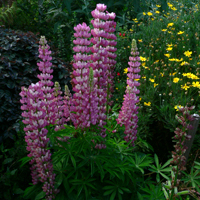 Most Lupins are hybrids bred for colour and size as well as plant formation. Species Lupins are also available including : Lupinus nanus, a dwarf or 'low growing species'. Lupinus elegans, a slightly taller than nanus. Lupin regalis is a taller growing species, although dwarf cultivars are available. Lupinus chamissonis is a bushy species. Lupins being a perennial, die back in winter to reappear in spring, some protection from snails is needed when new shoots begin to appear. Lupin seeds can be planted in spring outdoors or earlier indoors, germination will take 4 - 10 days. Soaking seeds in warm water before planting is said to enhance germination. Seeds planted indoors or in a cold frame can be transplanted to the garden after 2-3 weeks. Remember to protect young plants from snails and slugs. A well dug deep soil is essential as lupins like to put down a long tap root, this also means, do not disturb and usually, do not grow in containers. Lupins are not great lime lovers either. Donkey Meadow, Woolsery, Bideford, Devon, EX39 5QH.